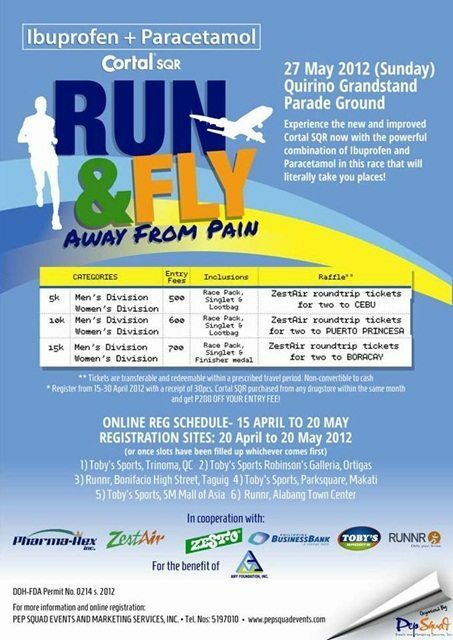 Cortal SQR, the pain reliever from Pharma-Rex Inc. that gives the safest and quickest relief from body pain through its advanced formulation of Ibuprofen and Paracetamol, invites everyone to join the “Cortal SQR Run and Fly Away from Pain” running event. For the benefit of the academic scholars of the AMY Foundation, the fun run will be held on May 27, 2012 along Roxas Boulevard, stretching from the cities of Manila to Pasay City. Participants will not just get the opportunity to be part of a fun physical workout and help send scholars to school, but they will also get the chance to win round trip tickets from ZestAir! Two round trip ZestAir tickets to prime domestic destinations will be raffled off among the participants of each of the categories. Prizes are two round trip ZestAir tickets to Cebu for the 5K participants, two round trip ZestAir tickets to Puerto Princesa, Palawan for 10K runners, and two round trip ZestAir tickets to Boracay for those who registered in the 15K run. Tickets are transferable and redeemable within a prescribed travel period but are non-convertible to cash. Registration fee is PhP 500 for 5K, PhP 600 for 10K and PhP700 for 15K. The registration fee is inclusive of a Race Pack and a Singlet Kit and a Loot Bag. A Finisher Medal is included for the 15K Run. Interested parties may register from April 15 to May 24 at Toby’s Sports Trinoma, Toby’s Sports Megamall, Runner Bonifacio High Street, Toby’s Sports Parksquare and Toby’s Sports Mall of Asia. But if participants register from April 15 to 30 with a receipt of 30 pieces of Cortal SQR purchased from any drugstore within the same month, they can get a discount of PhP 200 from the entrance fee. For more information and online registration, please visit and like www.facebook.com/cortalsqr or contact PEP Squad Events and Marketing Services Inc. at 519-7010 and 519-8980 or www.pepsquadevents.com.